What makes a wave good for the best pro level riders like Drew Danielo, Ashley Kidd and Keenan Flegel is the length and power (push) of a pro level surf wave, the same characteristics that make a wakesurfing wave easier for beginners. The more power a wave generates, the easier it is to keep the wave without the rope. Additionally, a longer surf wave allows you to make more mistakes while learning and still keep the wave from passing you by and falling. People often (very often) tell me that they are not able to throw in the rope or that they have to surf right next to the platform. It just boggles my mind how often I see this at the lake. New boats surfing and the owners cannot throw in the rope. 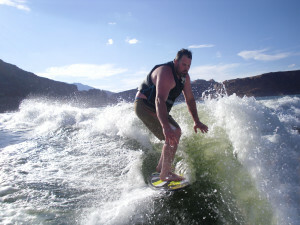 News flash, people, this is not how wakesurfing should be; in fact, it really isn’t even surfing at all. I find it almost comical, almost. that most riders who experience these problems blame it on the board they are riding, that it is too rough, or even worse that they are too old or too big and heavy, seldom is that the case. The reason they can’t surf is simply the boat they are surfing behind can’t produce the kind of wave they need – a long wave with PUSH! I weigh over 200 lbs. and can surf 30+ feet behind the boat on a small Phase 5 skim board; I just need to have the right wave. In fact, I have friends and students as big as 6’6” and weighing in at over 300 lbs. who can surf just fine, carving up and down the wave, fading back and just plain having a great time (key phrase here is having a great time”). In fact in 14 years of teaching people to surf, I have only had one person that has not been able to surf, really surf. The right wave really does make it all possible. Bottom line is having a pro level surf wave makes it easier at all levels and in the end, more fun (that’s what it’s all about, right?). Please see our blog “There is No Replacement for Displacement” for additional information about making waves.